Cindy has a particular interest in genetics and she has been involved in various clinical research in prenatal diagnosis. Her medical interest lies in Obstetrics and Gynaecology and Family Medicine. In her spare time she enjoys playing the cello and the piano. Chris is an enthusiastic teacher of Obstetrics and Gynaecology and encourages medical students (and junior doctors) to question their practice, challenge the dogmas of their speciality, and continually develop their clinical and surgical skills to best serve their patients. Ovarian torsion is the fifth most common gynaecological emergency with a reported prevalence of 2.7% in all cases of acute abdominal pain. It is defined as the partial or complete rotation of the adnexa around its ovarian vascular axis that may cause an interruption in the ovarian blood flow. Ischaemia is therefore, a possible consequence and this may lead to subsequent necrosis of the ovary and necessitate resection. As symptoms of ovarian torsion are non-specific and variable, this condition remains a diagnostic challenge with potential implications for future fertility. Consequently, clinical suspicion and timely intervention are crucial for ovarian salvage. This case report illustrates the multiple diagnoses that may be incorrectly ascribed to the variable presentations of ovarian torsion. Furthermore, a conservative treatment approach is described in a 22-year old nulliparous woman, with the aim of preserving her fertility. A 22 year old nulliparous woman presented to the emergency department in the middle of her regular 28 day menstrual cycle with sudden onset of right iliac fossa pain. The pain was post-coital, of a few hours duration and radiating to the back. The pain was described as constant, severe and sharp, and associated with episodes of emesis. Similar episodes of pain were experienced in the previous few weeks. These were, however, shorter in duration and resolved spontaneously. She was otherwise well and had no associated gastrointestinal or genitourinary symptoms. She had no past medical or surgical history and specifically was not using the oral contraceptive pill as a form of contraception. She was in a two year monogamous relationship, did not experience any dyspareunia and denied any prior sexually transmitted diseases. Her cervical smears were up to date and had been consistently reported as normal. On examination, she was afebrile with a heart rate of 90 beats per minute (bpm) and a blood pressure of 126/92 mmHg. Her abdomen was described as “soft” but she displayed voluntary guarding particularly in the right iliac fossa. There was no renal angle tenderness and bowel sounds were present. Speculum examination did not demonstrate any vaginal discharge and bimanual pelvic examination demonstrated cervical excitation with significant discomfort in the right adnexa. Urinalysis did not suggest a urinary tract infection due to the absence of protein or blood in the urine sample. The corresponding urine pregnancy test was negative. Her blood tests confirmed the negative urine pregnancy test. There was a mild leukocytosis, and the CRP was normal. Pelvic ultrasound demonstrated bilaterally enlarged ovaries that contained multiple echogenic masses measuring 31mm, 14.4mm, and 2mm on the right side, and 6mm, 17mm and 2mm on the left side. 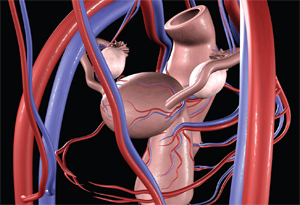 Blood supply to both ovaries was described as determined by blood flow Doppler. There was a small amount of free fluid in the pouch of Douglas. The report suggested there were no features suggestive of acute appendicitis and that the findings were interpreted as bilateral endometriomas. Initially her pain was unresponsive to narcotic analgesics but she was later discharged home with simple analgesics as her symptoms improved. Two days later she represented to the hospital with an episode of post-coital vaginal bleeding and uncontrolled ongoing severe lower abdominal pain. She was now febrile with a temperature of 38.2°C and a heart rate of 92 bpm. Her blood pressure was 114/66 mmHg. Repeat blood tests revealed a slightly raised CRP of 110 mg/L and a WCC of 11.5 x109/L. Abdominal and pelvic examinations elicited guarding and severe tenderness. On this occasion endocervical and high vaginal swabs were taken and she was treated for pelvic inflammatory disease based on her raised temperature and elevated CRP. Subsequently, a repeated pelvic ultrasound showed bilaterally enlarged ovaries similar to the previous ultrasound. On this occasion, the ultrasound findings were interpreted as bilateral ovarian dermoids. No comment was made on ovarian blood flow, but in the right iliac fossa a tubular blind-ended, non-compressible, hyperaemic structure measuring up to 8mm in diameter was described. These latter findings were considered consistent with appendicitis. The patient was admitted and the decision was made for an emergency laparoscopy. Intraoperative findings revealed an 6cm diameter partially torted left ovary containing multiple cysts, and an 8cm dark haemorrhagic oedematous torted right ovary (Figure 1). There was a haemoperitoneum of 100 mL. Of note there was a normal appearing appendix and no evidence of adhesions, infection or endometriosis throughout the pelvis. Laparoscopically, the right ovary was untwisted and three cystic structures, suggestive of ovarian teratomas were removed intact from the left ovary. The nature of these cystic structures was confirmed by the subsequent histopathology report of mature cystic teratomas. During this time the colouration to the right ovary was re-established. Even though the ultrasound scan suggested cystic structures within the right ovary, due to the oedematous nature of this ovary and the haematoperitoneum that appeared to have arisen from this ovary, no attempt was made at this time to reduce the size of the ovary by cystectomy. The postoperative period was uneventful and she was discharged home on the following day. She was well two weeks post-operation and her port sites had healed as expected. Due to the possibility of further cystic structures within her right and left ovary, a repeat pelvic ultrasound was organised in four months. The patient was reminded of her high risk of re-torsion and advised to represent early if there were any further episodes of abdominal pain. The repeat ultrasound scan confirmed the presence of two ovarian cystic structures within the left ovary measuring 3.5cm and 1.3cm in diameter as well as a 5.5cm cystic structure in the right ovary. The ultrasound scan features of these structures were consistent with ovarian dermoids. She is currently awaiting an elective laparoscopy to perform bilateral ovarian cystectomies of these dermoid structures. Ovarian torsion can occur at any age with the greatest incidence in women 20-30 years of age. About 70% of ovarian torsion occurs on the right side, which is hypothesised to occur due the longer uteroovarian ligament on this side. In addition, the limited space due to the presence of the sigmoid colon on the left side is also thought to contribute to the laterality incidence. This is consistent with this case report in which there was partial torsion on the left side and complete torsion on the right side. The diagnosis of ovarian torsion is challenging as the clinical parameters yield low sensitivity and specificity. Abdominal pain is reported in the majority of patients with ovarian torsion, but the characteristics of this pain are variable. Sudden onset pain occurs in 59-87%, sharp or stabbing in 70%, and pain radiating to the flank, back or groin in 51% of patients. [4,8] Patients with incomplete torsion may present with severe pain separated by asymptomatic periods. Nausea and vomiting is common in 59-85% of cases and a low grade fever in 20%. [4,8] Other non-specific symptoms including non-menstrual vaginal bleeding and leukocytosis, reported in about 4.4% and 20% of cases, respectively. In this case report the patient presented with such non-specific symptoms. These symptoms are common to many other differential diagnoses of an acute abdomen, including: ectopic pregnancy, ruptured ovarian cyst, pelvic inflammatory disease, gastrointestinal infection, appendicitis, and diverticulitis. In fact, the patient was initially incorrectly diagnosed as having bilateral endometriomas and together with ultrasound scan features, appendicitis was considered. Acute appendicitis is the most common differential diagnosis in patients with ovarian torsion. Fortunately, this usually results in an operative intervention. Therefore, if a misdiagnosis has occurred, the gynaecologist is usually summoned to deal with the ovarian torsion. Conversely, gastrointestinal infection and pelvic inflammatory disease are non-surgical misdiagnoses that may result in delayed surgical intervention. Consequently, it is not surprising that in one study, ovarian torsion was only considered in the admitting differential diagnosis of 19-47% of patients with actual ovarian torsion. In this present case report, the patient had variable symptoms during the course of her presentations and ovarian torsion was not initially considered. Furthermore, the use of ultrasound scan Doppler results in highly variable interpretations and some studies disagree on its usefulness. [1,2] Because cessation of venous flow precedes the interruptions in arterial flow, the presence of blood flow on ultrasound scan Doppler studies indicates probable viability of the ovary rather than the absence of ovarian torsion. [2,13] In the presented case, both ovaries demonstrated blood flow two days prior to the patient receiving an operation to de-tort her left ovary. However, it is possible that complete ovarian torsion actually occurred after the last ultrasound was performed. Other imaging modalities, such as contrast CT and MRI, are rarely useful when the ultrasound findings are inconclusive. Thus, direct visualisation by laparoscopy or laparotomy is the gold standard to confirm the diagnosis of ovarian torsion. This ovary sparing approach after detorsion of ischaemic ovaries is considered safe and effective in both adults and children. [19,20] A cystectomy is usually performed on suspected organic cysts for histological examination. In the case of difficult cystectomy due to ischaemic oedematous ovary, some authors recommend a reexamination 6-8 weeks following the acute episode and secondary surgery at this later time if necessary. [5,19,20] In this case report, detorsion alone of the haemorrhagic left ovary was sufficient to resolve the pain, allowing a second laparoscopic procedure to be arranged in order to remove the causative pathology. 1. Ovarian torsion is difficult to diagnose clinically and on ultrasound. 2. Clinical suspicion of ovarian torsion determines the likelihood of operation. 3. Laparoscopy is the surgical approach of choice. 4. Detorsion is safe and may be preferred over excision of the torted ovary. What did I learn from this case and my reading? 1. Accurate diagnosis of ovarian torsion is difficult. 2. Suspicion of ovarian torsion should be managed, like testicular torsion, as a surgical emergency. 3. An early laparoscopy/laparotomy should be considered in order to avoid making an inaccurate diagnosis that may significantly impact on a woman’s future fertility. 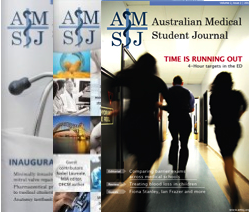 The authors would like to acknowledge the Graduate School of Medicine, University of Wollongong for the opportunity to undertake a selective rotation in the Obstetrics and Gynaecology Department at the Wollongong Hospital. In addition, we would like to extend a special thank you to Ms. Sandra Carbery (Secretary to A/Prof Georgiou) and the Wollongong Hospital library staff for their assistance with this research project. Consent to publish this case report (including figure) was obtained from the patient.